A massive continent, Africa's greatest diversity of trees occurs south of the Sahara Desert, where rainfall is abundant and temperatures remain warm year-round. Hundreds of tree species can be seen on the most basic of vacations to Africa, from a safari to a walk in a large city's botanical gardens. Many of these trees now grow in parks in other subtropical and tropical regions around the world, dazzling admirers with their architectural silhouettes, pretty flowers and amazing fruits. Jackalberry (Diospyros mespiliformus), also called African ebony, is found across much of Africa from Senegal and the Sudan to Namibia and South Africa. It is most commonly found on savannas or savanna woodlands where it can be seen growing on termite mounds. Animals such as nyalas, impalas, warthogs, baboons and hornbills eat the fruit of the jackalberry. This tree got its name because its seeds are also found in the dung of jackals. The tree's leaves are eaten by elephants, rhinos, giraffes, buffaloes and kudus. Jackalberry grows 80 feet tall and nearly 50 feet wide with a canopy high up on the tall trunk. The umbrella thorn (Acacia tortilis) is one of the most widely distributed species of acacia tree on the continent. Its native range extends from Mozambique, Botswana, Swaziland, Transvaal, Orange Free State and the Cape in South Africa on the dry savannas. Seeing this tree tends to reveal areas of good soil and good grasses, according to the Kruger National Park website. Thorny branches and copious production of seed pods are characteristic of the umbrella thorn, and the fallen seeds are eaten by kudu, impala, rhino and elephant. Umbrella thorn has an umbrella-like canopy and grows upwards of 65 feet tall and 20 to 30 feet wide. 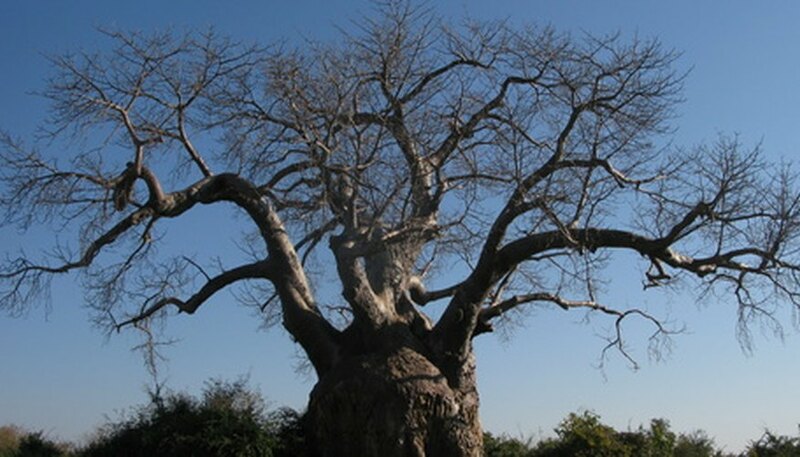 Slow growing and deciduous, the baobab, or "dead rat tree" (Adansonia digitata), becomes an architecturally magnificent tree on the African plains across much of sub-Saharan Africa. The trunk looks like a massive leg of an elephant or extinct dinosaur and its wide branches stretch out far on the bottle-like trunk as it ages, perhaps over a thousand years. The white flowers that are pollinated at night by bats yield large woody fruits that dangle by a long stem, making them look like hanging rats. Baobab trees grow 60 to 70 feet tall and as broadly spreading as 75 feet. Marula (Scelerocarya birrea) is a large, round-crowned deciduous tree growing 50 feet tall and equally wide. The fruits that form on the tree are golf ball-sized, taste like mangoes and are rich in vitamin C. Native from Ethiopia to South Africa, marula is also called "drunkard's plum." Marula liquer and beer are made from the fruits. Warthog, elephant, waterbuck, giraffe and kudu all eat the fruit and leaves of the tree. A large evergreen tree native to the humid plains and forests of the lush equatorial reaches of Africa, African tulip tree (Spathodea campanulata) grows 75 feet tall and 60 feet wide at maturity. It is also called "fire tree" or "Gabon tulip tree." Fast-growing and shallow-rooted, it displays large flower clusters of vivid orange or gold on branch tips in spring and summer. Each blossom is trumpet- to cup-shaped, resembling a tulip flower, and is filled with nectar for birds to engorge. Later, long, brown seed capsules form and huntsmen boil the fruit kernels inside to obtain a poisonous liquid to lace the tips of hunting arrows, according to Margaret Barwick in "Tropical and Subtropical Trees."